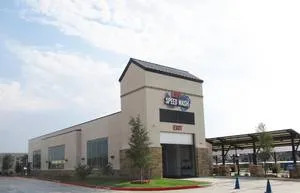 With today’s fast paced society and technological advancements moving even faster, more consumers are utilizing express car washes, which often leaves the full-serve and flex car wash owners considering remodeling. One of the first decisions a car wash owner will need to make is whether or not to change the model type of the car wash from a full-serve to a flex or to an express model. Following closely behind that decision will be to determine what type of model the surrounding market demands or can support. When considering remodeling it’s important to remember that labor forces the change, and each of the different model types has different labor needs. Labor pressures have changed the momentum of the industry from the full-serve model that requires numerous personnel to perform car wash services to a flex model that reduces the labor component. Lastly, owners will need to decide which pieces of equipment are outdated, worn out, and need to be replaced with more technologically advanced equipment. These decisions will lead to the next question: Can the car wash infrastructure support those changes or would it be best to start from scratch. 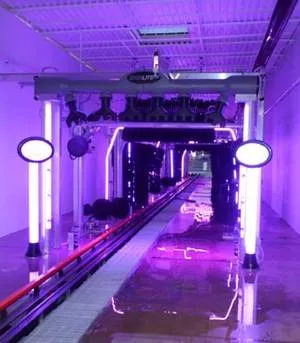 The most significant remodel change is evident in converting a full-service car wash into a flex car wash. Remodeling a full-service wash to a flex can lower the operational cost of a car wash with better space utilization, creating a reduction in utility costs and personnel thus making a flex wash more efficient through innovation, layout, and technology. Innovation, technology, and labor reductions are further evident when remodeling a flex wash to an express model. The majority of express washes offer only exterior cleaning and are fully automated, and as a result the personnel necessary to operate it is minimal. Consumers have come to prefer the express model as it is speed and value driven, has reduced wait time, and is overall more convenient. Over the course of the last 60 years, the car wash industry has implemented innovations and new technologies. Such changes have been instrumental in speeding up the wash process and reducing wait time, making it overall moreconvenient for the customer and also assisting the owner in operating a more efficient car wash. While numerous innovations have helped the car wash industry over the years there are a few that are higher priorities when considering a remodel. Cash management systems and pay stations with RFID readers and high-speed credit card clearing have replaced employee operated pay points, which reduces a labor component and is one of the motivations car wash owners have when deciding to remodel. • Conveyor-dollie and chain conveyors have been refined through better engineering and advanced materials to eliminate jammed dollies and produce smoother operation. • Flattop conveyors entered the market and are being refined, although they have created challenges for wheel cleaning and online tire dressing. • Online tire dressing applicators have gone through many revisions and are not yet capable of matching hand-applied tire dressing, but seem to be acceptable to most of the motoring public. • High-pressure assist for both vehicle and wheels has improved immensely by supporting the cleaning process, especially in the detailed facets of the automobile where friction has a difficult time reaching. • Dryers are becoming more efficient and more economical to operate through better design and engineering of blower housings, impellers, and the addition of air gates. • After air dryer, shammy friction drying machinery is being added to assist in detailed drying but additional design and engineering still needs to be pursued. • Vacuum equipment is improved through better and more efficient motors, impellers, and filtration media. With the development of the arch-integrated stanchion and vacuum piping type, the equipment has become more aesthetically pleasing. • Now that electrical components have become more affordable, we see the addition of better and smaller motor controls, the addition of VFDs (variable frequency drives), and gearbox improvements. • Advancements in water filtration and reclamation have also been effective in delivering cleaner water and improved water quality through technology. • Experiments with different types of wash media continue to improve on delivering a quieter experience for the consumer and less potential for vehicle damage. • Real-time cash management monitoring access and equipment fault notifications — owner receives notifications via e-mail or text. • Remote camera access and on-conveyor vehicle movement monitoring — real-time camera systems and software mitigate vehicle damage and reduce liability. A lighting display attracts attention. Advancements in chemistry over the years has also played an important role in the remodeling process. Chemicals are now more concentrated and custom-blended at the car wash thus reducing waste due to smaller, space-saving containers which are more economical to ship. More importantly, the chemistry is more environmentally friendly, biodegradable, and safer all around. 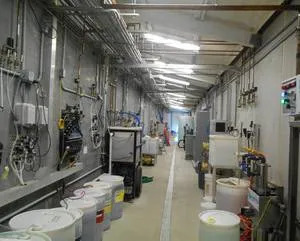 Also, with the addition of equipment that can supply constant water pressure and volume, chemical application has achieved a much greater consistency. The decision to remodel also relies on the advancements made in marketing over the years. Signage — both stagnant and digital — and color-coded lighting play an important role in marketing a car wash to consumers while also providing more flexibility to the owner. Effective signage through the use of menus, directional signage, marquee, and street signs will not only be more informative and communicate more quickly to the customer but will also be visually more satisfying and more effective at capturing their attention. With the 21st century now being more technology-driven than ever before, successful operators will use these advancements to capitalize on their marketing by incorporating them into the remodeling process. With all of this automation and potential reduction in customer/operator interaction, especially in the exterior model, the delivery of a clean, shiny, dry vehicle becomes more consistent. However, the results of that could be more commoditization of the product, which could lead to less customer loyalty. Ralph Nasca is an industry veteran and manager of Lewisville, TX-based Pro-Tech Service Company LLC. You can visit the company on the web at www.pro-tech-service.com.